A friend tagged me on a Facebook post last week. The author was wondering if local yoga teachers were talking about the election in their classes – particularly wondering if local yoga teachers were using their classes to campaign against the Harper Conservatives. In my imagination… downward dog at the barricades, waving flags of resistance in mountain pose as we stand on guard for trees. Then I thought about it some more. Would a yoga teacher lose students if they started talking about Bill C-51, the narc on your Muslim neighbor hotline, Missing and Murdered Indigenous Women, or the TPP trade agreement in their classes? Would it offend conservative students? Would it bore apolitical students? Or would it, like almost everything else yoga teachers say in their classes, swirl around in the minds of students for a short while before floating off into mind-space in the depths of relaxation? Personally, I suspect most of my students would simply nod and agree and that there would be no noticeable change in the size of my classes. So does that mean I am officially on the yogic campaign trail? I will not be talking about the election in my classes. I am a socialist. I will, most likely, vote for the NDP not because I am aligned with their politics but because their candidate seems most likely to unseat the Conservatives in my riding. But that will not be finding its way into my classes. If a student is curious about how I plan to vote, I will happily share that information with them just as I have shared it with you. But I will not attempt to persuade anybody to vote any particular way. This is not a “yoga is not political” statement. That statement is not only historically inaccurate but pretends that spirituality and health can be divorced or separated from the social and economic contexts in which they are encountered. No such separation is possible, nor has it been possible in the past. For centuries yogis have maintained close relationships with the ruling class. Yogis were well known for influencing social policy through sometimes nefarious dealings and trickery. The royal family in Mysore employed the originator of contemporary postural yoga, Tirumalai Krishnamacharya. It is well known that BKS Iyengar was a supporter of the BJP – a nationalist political party in India. Swami Sivananda received a great deal of patronage from the Shiv Sena, another right wing Indian political party. And today one of the biggest supporters of the Modi government is the famous televangeliyogi (I just invented a word!) Baba Ramdev. One might imagine yoga as a form of activism that functions quite differently than typical political activism. Yoga class should be a welcoming, inclusive environment where a (hopefully) diverse group of people can enjoy the simple pleasures of breath, movement, and stillness. As we melt into the bliss of the present moment, it dawns on us that we are permeable. We are not separate from our environment. Our minds are as porous as our skin. It begins as a simple realization. What we do to others we are doing to ourselves. What we do to our environment we are doing to ourselves. It is a slow transformative process that requires patience and understanding. We start to observe our thoughts and consider why we think the way we think. We realize that the way we move and think is the product of years of conditioning. Yoga changes how we think of our world and ourselves. It doesn’t change in a predictable way. It doesn’t change in such a way that it reflects the thinking of the teacher. It is entirely organic, spontaneous, and self-directed. The autonomy of the student should be the goal of the teacher. Yoga teachers should be teaching themselves right out of a job. We create some space in which students investigate their patterns and make decisions about if, how, when, and to what extent they should make conscious changes to those patterns. Any changes that take place happen autonomously. Students of yoga very often begin with some simple stretching and relaxation and end up making significant life changes. But those life changes need to arise as a result of a complex, contemplative and intimate process – not because somebody told you so. A yoga teacher’s primary responsibility is to create a safe and intelligent environment in which students can explore the bodymind in search of the imagined boundaries that delineate this thing called a “me” in relationship to “the outside.” That is an inherently social, and therefore political process. If you believe that who you are is contained within and defined by your skin, your selfishness leads you to benefit yourself at the expense of others. There is only so much pizza to go around, you know? Watching me eat pizza only means less pizza for you. If you believe that who you are is contained within and defined by your family, your selfishness leads to you protect your family at the expense of others. The same could be said of any identifying your self with a particular nationality or with a particular class. But what happens when you start to experience your “self” as part of an integrated whole that include all life on the planet? I believe yoga is revolutionary because it can cause a shift in identity. Especially when integrated with a regular meditation practice, yoga can lead to a massively expanded notion of who we are. As Alan Watts said, we do not come into this world – we come out of it. Like waves on the surface on the ocean or blades of grass on the lawn, we literally part of the world. This is not a new insight. As early as the Chandogya Upanishad (approximately 2500 years ago!) seers have been saying this very thing. I am not without cynicism. I realize that yoga can also deepen narcissistic delusions and act as a tonic to temporary relieve the guilt and tension of first world living so that we can make more bearable a lifestyle that we all know is unsustainable. But I practice and teach with optimism. I am optimistic that we can change ourselves for the better and as a result co-create a world that is based on compassion, mutual aid, solidarity, and understanding. It does not matter if you take yoga selfies or not. It doesn’t bother me if somebody thinks one of my yoga selfies is self-indulgent or inspirational. I am much more interested in what it all means. There is no point taking a stand about something without first attempting to better understand that thing. For example, how can we understand a yoga selfie in the context of contemporary yoga? What does it mean? How does it relate to the bigger picture of yoga today? Yoga is considered a “common tradition” with one of the oldest philosophical systems of India, Samkhya. Samkhya means “counting” and attempts to take an inventory of the known universe – ultimately enumerating twenty-five basic principles upon which our world is built. Two of these are purusha (self) and prakrti (nature). These are often imagined as masculine and feminine, spirit and matter, or big self and small self. The thinking is actually fairly simple. Life is constantly changing. Some of those changes are good, but some of them cause suffering. To get away from suffering, get away from all the things that change. Then you see the suffering rather than being the suffering. Although we pay significant lip service to the wisdom and authority of the yoga sutras, the majority of our yoga practice and experience does not align with the “up and out” ideology contained within its pages. We practice yoga to enjoy being in our bodies, not to become disembodied. We practice so that we can better manage emotional turbulence, not to disengage entirely from the fluctuating nature of the thinking, feeling mind. The yoga selfie is a great example of yoga from the perspective of the seen, rather than of the seer. Rather than abiding in the essence of the seer (drastuh or purusha) we might choose to abide in the essence of the seen. We can choose to consciously embody the ever-shifting field of energy and light that is our prakriti. That doesn’t mean that the seen is not also the seer – it just means one of the ways in which you might enjoy the experience of life is to be seen. Like a kid on a diving board getting ready for an epic cannon-ball, we call out to our friends to “look at me” before taking the leap. This does not have to be an exercise in self-indulgence. It can simply be a way of enjoying yourself and creating enjoyment for others. Being the seen, performing for the small screen of Facebook and Instagram, has the capacity to amaze, inspire, and captivate. That might not be what Patanjali had in mind…but he never had an IPhone. If we desire dissolution into pure subjectivity and the stillness of ever-present awareness, then yoga selfies are probably not for us. But they pose no threat to the authenticity and integrity of yoga traditions, so we can just relax and continue our yogic disappearing act. Even the authenticity and integrity of yoga is just a thought that will ultimately dissolve into meditative awareness anyway. But if you want to dance into the pulsating field that is our psycho-physical self, then there is great value is allowing yourself to be seen. It may be that there is a part of yourself that yearns to be seen, a part of you that has been standing on the diving board waiting for someone to watch you splash into life. True relaxation arises in simple acceptance of things as they are. That is to say one you do not require a peaceful or tranquil environment in order to relax. The opposite seems to be true. Even in the most relaxing environments people still manage to get stressed out (“the water is too green,” “my bathing suit looks bad,” it’s too hot,” “my vacation is almost over” etc…). In each of the above examples, the stress is not coming from the environment, but from the resistance to the environment. 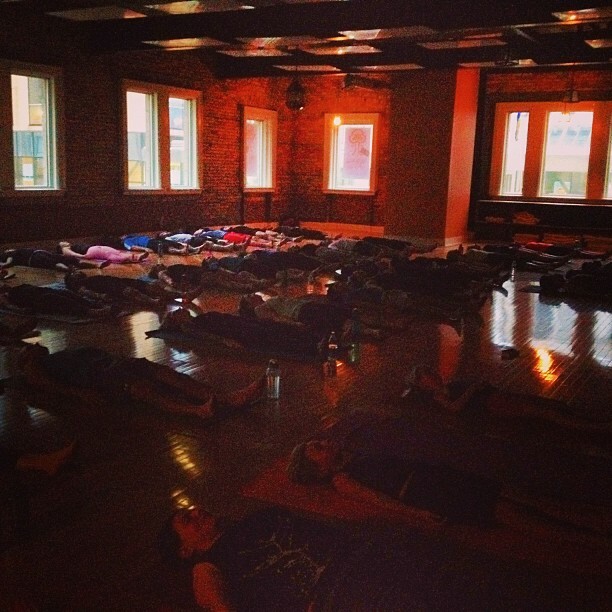 Students at Bodhi Tree Yoga relaxing in savasana. lines up with our perception of how things should be, we no longer put up a fight and as a result we feel a great deal of peacefulness and wellbeing. From this arises the mistaken notion that it was the “just rightness” that caused the relaxation. But the “just-rightness” is in the environment, not in us. The relaxation comes because when everything is just right we stop resisting things as they are. And therein lies the secret. True relaxation arises from within. Independent of context, true relaxation comes from not resisting and allowing everything to be as it is. So even with green water, questionable swimwear, hot weather, and a vacation nearing its end – you can still be perfectly relaxed. OBSERVE: Something is causing the stressful reaction. Often it is extremely obvious and therefore this first step can seem redundant. If, however, the actual cause of the stress is unknown then this first step is crucial. For example, if you are being chased naked through the streets by a giant rabid porcupine then the cause of the stress is known and the stress itself is a functional response that may help you to avoid one of those massive quills in the back. This is acute stress. Giant rabid porcupines are not common in these parts, though. Neither is any of the great variety of life-and-death situations in which stress is useful. For the most part stress is chronic, rather than acute. Chronic stress arises when a remembered or anticipated stressful event is played out over and over in the body and mind, resulting in your blood pressure increasing, heart pounding, and shortness of breath. You need to observe which kind of stress you are experiencing – chronic or acute. If it is acute – keep running. If it is chronic – on to step 2. RESPECT: First let me clarify what I mean by respect. You often hear teachers of yoga talking about “respecting your limits” in postures. By that they generally mean approaching your limits as you would approach an something fragile – carefully and without aggressiveness. I mean something quite different. The word respect is derived from the Latin respicere which means to look back or to reconsider. That is precisely what I mean when I say respect your stress. After observing your stress and determining if it is acute or (more likely) chronic, you need to take a closer look. It will not be helpful to start thinking “oh this is chronic stress so I should just relax” – that just doesn’t work. Think of your body like a puppy. If a puppy is under stress and is scared we can’t just explain to it that is has no reason to fear. We need first to respect (reconsider) the stress in order to better understand it such that we might be able to help. Reconsider the causes of your stress – is it something that happened in the past? Are you suffering from the after-effects of some trauma like an assault or otherwise violent encounter? It is possible you require a safe, nurturing, therapeutic environment in which to heal. It is also possible that you are stressed about something that has not happened, or something that you imagine might happen. Sometimes the simple realization that we do not know the future is enough to disentangle our minds from the hooks and tangles of worry. INTEGRATE: Do not deny or ignore your feelings. When you are stressed, you are stressed. Perhaps the worst thing you could is get stressed out precisely because you feel you should not be stressed out. Acknowledging and accepting your feelings of stress does not mean allowing stress to become a permanent fact of daily life. It only means claiming the stress such that you can move forward in an intelligent way. It means seeing things as they are. Sometimes you get stressed out. You can be awake, mindful and aware, and still experience stress from time to time. Sometimes you allow the stress to act as fuel to burn through the obstacles that temporarily interfere with your freedom and happiness. That obstacle might be a deadline at work or a giant, rabid porcupine. Either way you can observe the stressful response, get some perspective on your body’s response, and integrate that response into meaningful and effective action. If, upon reflection, you find that the majority of your stress is chronic by nature then the actions you take should reflect that. For example, if you are constantly anticipating or recalling stressful encounters then the appropriate action should be focusing on living more in the present moment. True relaxation doesn’t come from beaches, vacations, or even from yoga classes. True relaxation comes from deep within you, from the stillness within you that does not argue with or resist reality in any way. There are moments in every person’s life that are, by their nature, stressful. But one who is able to find true relaxation deep within oneself is not made a victim by these fleeting, stressful encounters. Such a person rises to meet the challenges that confront them only to soften back into the ever-present silence that serves as an anchor in the tumultuous waters of daily life. There was a student who lived in Europe but spent a summer in Regina. He quickly became a regular at the studio and I always enjoyed having him in classes. His eyes were bright and attentive and he was quick to smile and laugh at my terrible jokes. It was one of the most heart-warming and meaningful compliments I have ever heard about the Bodhi. I take great pride in the friendliness of our yoga community. You will be welcomed here. People will be interested in you…and not because they are paid to do so. Yes, our teachers and desk staff are brimming with kindness because that is the kind of person with whom we choose to surround ourselves. But I am not even talking about our staff. I am talking about the students at Bodhi Tree. I suppose I am talking about you. Friendliness (maitri) is a yogic practice. In the yoga sutras it is offered as a practice that brings a serenity and grace. In Buddhist Pali texts maitri is referred as metta – lovingkindness. It is the practice being fearlessly open-hearted. The practice of friendliness should, like the practice of mindfulness, start small and move outward in ever increasing circles until it encompasses the entire cosmos. You can do this practice right now as you read. Use your imagination. Start with your body. It always tries its best. It gets tired, hungry, beaten-up and still here we are. Our body is like a loyal pet. Even though it poops on the lawn and gets fur on the couch, we should love it because all it ever does is love us. Next practice friendliness with your breath. Do not try to make it do something different. Simply notice how it is moving and allow it to move that way. Enjoy the way it feels. Like the body, the breath just keeps trying to serve us in the only way it knows how. It speeds up and slows down, it shudders and sighs, fluid and wild in response to the movement of our lives. Now the mind. Oh my goodness. A frienemy? If I can be very honest sometimes my mind spins stories that do not seem so friendly. There are voices in my mind that tell me I am not good enough. There are voices that say “Nobody reads this stuff… you should just give up.” Do you have similar voices? Practice friendliness with those voices. A part of us is scared and does not want to get hurt. Those voices are trying to protect us from harm. We can smile, put our arm around those scared parts of ourselves, and tell them it is going to be OK. It is true, going out on a limb sometimes proceeds a loud crack and unceremonious tangle of limbs tumbling back to earth. But it is worth the risk. Now practice friendliness with your close friends and family. Imagine your spouse, parent, or child sitting with you right now. Notice your breath and imagine seeing them with soft, compassionate eyes. If you feel tears welling up don’t hold them back. Offer your tears as a testament to the depth of your affection. Open your circle of friendliness to include somebody you know, but not that well. Maybe somebody you met recently. Imagine sitting quietly with them, holding them in your soft eyes with the same attention you offered to your loved ones. It feels vulnerable. You can practice sitting with that person without your social mask. Open and unguarded, welcome them into your heart. Do the same thing with somebody you have never even met. Celebrities are good for this because we know what they look like, but actually we have no idea who they really are. Do the same thing with somebody you think of as an opponent. Your nemesis. The person who will play the role of the antagonist in your biopic. Visualize this person sitting with you and just allow your breath to move naturally. Maintain your softness and vulnerability. They can’t hurt you now. This is the fun part. You know that photo of earth taken from the moon where we look like a marble floating in space? Visualize that. Imagine yourself as a tiny speck of awareness on that marble, sending out friendliness in ever-expanding concentric circles of loving-kindess radiating outward until you are holding the entire world in the friendliness of your attention. Stay there for as long as you like. If it doesn’t feel amazing, massive, spacious, and illuminating then fake it. Make the face that somebody experiencing those things would make. Breathe like you imagine somebody having that experience would breathe. If it does feel amazing, massive, spacious and illuminating…enjoy! When you are ready to stop, take a few moments to sit quietly and gather yourself. The world may or may not be ready to experience the fullness of your love and attention like that. Ponder one or two ways that you might integrate some of this experience in the rest of your day. In that essay I argued that yoga asanas have no independent existence outside the body of the practitioner. Not only does downward dog not have alignment, it actually does not exist. The pose only comes into existence when a practitioner chooses to take on that particular shape. It may seem like a semantic issue, but I think there are some implications in terms of how yoga is taught. If the postures are dependent on the practitioner, then the posture takes a backseat to the student. If we accept that there is no posture without the practitioner, then every asana and every sequence should be modified to meet the needs of the student. This essentially shatters the notion of particular sequences (Bikram, the primary series of Ashtanga, and Sivananda) being sacred, special, or worth repeating every day for the rest of your life. It is not possible for one sequence to meet the constantly changing context that it our body-mind-life. But before we start burning our copies of Light on Yoga and dancing on the graves of the 20th Century masters of yoga, maybe we should give this a little more thought. Just because it is true that the rules don’t apply to all people in all contexts does not mean that you should not follow the rules. There are exceptional people who can do exceptional things, and more often than not it is because they have trained themselves to do those things. For example, there is a Dutch daredevil named Wim Hof who ran a full marathon in the polar circle in Finland wearing nothing but shorts. He also sat in an ice bath for almost 2 hours. He is able to control his nervous system through meditation in way that prevents hypothermia and death. So while we might be tempted to say “NEVER practice outdoor naked yoga when it is -20 celsius,” that would be incorrect because Wim Hof can do it. Would we be disrespecting Wim Hof with that instruction? Would we be saddling students with unnecessary dogma? Or would we actually just be teaching responsibly and preventing frostbitten privates? Human beings are amazing. I believe all things are possible. But just because some people can do exceptional things, does not mean that we should attempt to do the same. You should not hold your breath and dive to 100 meters in the ocean. Ever. Seriously you should not do that because you will probably die. But that doesn’t mean it is not possible. We are all beautiful and unique snowflakes. But all snowflakes melt if it gets warm enough. Many factors go into melting snowflakes: the size of the flake, the relative humidity, and the speed with which it falls to the ground. But turn up the heat enough and you have rain. Every time. Like snowflakes, our bodies are all beautiful and possessed of an impressive diversity of size, shape, density, and malleability. But they all break down. Knee cartilage can only take so much repetitive strain before it breaks. Lumbar discs are the same way. Like a plug-in that gets repeatedly ripped out of the electrical outlet by the cord, it will eventually break. You might yank the cord from the wall hundreds of times without any noticeable damage, but that doesn’t mean it is safe. Of course it is true that all of the rules and dogma in yoga asana are not absolute. The world is far too complex for that. But relatively speaking, the rules are there for a reason. That doesn’t mean accept them without question. It means be open minded, but not so open minded that your brain (or the nucleus pulposus of a lumbar disc) falls out. There is a character in Greek mythology named Sisyphus. You may have heard of him. He was king well known for his deceptive, dishonest, and ignoble manner of ruling his kingdom. When it was time for him to die, he even tricked Thanatos and managed to escape death. As you might suspect, Zeus and the other Gods were not impressed with Sisyphus and decided to teach him a lesson. He was punished with the unending frustration of pushing a rock up a hill. But the rock was enchanted and would slip and roll back down the hill just before making it to the pinnacle. And so we would have to forever begin again, pushing the rock every damn day. Like any myth, there are a number of ways to interpret this story. The way I see it, the rock represents your embodied human existence. It is destined to fall no matter how hard you push. Trying to outwit death, illness, and old age is committing your self to the maddening task of trying to accomplish the impossible. I started seeing this hashtag on social media a few years ago. At first I thought it was kind of cute. It seems to be all about commitment and dedication to your practice. But the more I saw it the more I began to get a funny feeling every time I read it. I would say it out loud and it did not elicit the spirit of relaxation and enjoyment that I associate with yoga practice. For starters I have never seen a photo of somebody mindfully cleaning their kitchen with the hashtag #yogaeverdamnday. Searching the hashtag earlier today, I found 2/500 photos of somebody meditating or doing pranayama with that hashtag attached. I saw inspirational quotes, people twerking, people checking their laptops while in pincha mayurasana (forearm balance), some cool variations of postures I had never seen before, a few impressive backbends, a couple waterfalls, a whole bunch of beaches and, of course, SO MANY BIKINIS. Don’t get me wrong now…I enjoy inversions, backbends, arm balances, and bikinis. But these were all impressive feats of strength and flexibility. There was all kinds of evidence that the subjects of these photos have dedicated themselves to accomplishing very cool looking poses. But then maybe that hashtag should be more like #PerformativeAsanaEveryDamnDay. I suppose that is not as catchy. The hashtag brings up an interesting question…one that has been making the rounds a little in the yoga blog world. Is it laudable, inspiring, or advisable to practice hatha yoga every damn day? Judging by my cursory Instagram research, it seems that is what is meant by #yogaeverydamnday. Not meditation every damn day. Not relaxation. Not measured and mindful breathing. Stretching and balancing every damn day. There is a consensus among all the medieval hatha yoga manuals that yoga should be practiced uninterrupted every day. But these manuals were written by and for renunciates who walked away from their jobs and families to find freedom. In many ways, the renunciate roots of hatha yoga are not really compatible with WEIRD (Western, Educated, Industrial, Rich, Democratic) cultures. Contemporary WEIRD yogis have jobs and families. We have friends and all kinds of social gatherings and obligations to which we must attend. Our attention is called in many directions. Those of us with children all recognize how much our attention they require. Our yoga practice may meet resistance in many forms, not all of which should be met with force (hatha) such that we can practice every damn day. Sometimes we need to be more yielding and forgiving with ourselves and others. Injuries need time to heal, children need our love and attention, and the laundry needs to be folded. Practicing yoga every damn day may actually be building resentment into our encounters with yoga. Just look at the language. We don’t need more “damn days” in our lives. The impression is that practicing yoga is a responsibility. But yoga is not something we should do because we have some kind of contractual obligation to do so. We should do it when we want, how we want, with whom we want, whenever it seems like a good idea. I want to kiss my wife because it feels good, not because #kissingeverydamnday. I enjoy having a beer while I BBQ, but I don’t want to #beereverydamnday. And I want to practice hatha yoga when it feels good, when my body and mind seem to be asking for it, not #everydamnday. Contemporary yogis who are compulsively practicing hatha yoga postures are like Sisyphus. Pushing our physical practice of these asanas up the hill of our embodied existence, we inevitably find ourselves watching as injuries, aging, or simply the rest of our lives causes our practice to roll back down through all that hard-earned real estate. If I get an email informing me that Pattabhi Jois never actually said this, I wouldn’t be surprised. And it wouldn’t make me re-think this essay too much either. It is not the origin of the quote in which I am interested. That is in the past. It is the present popularity of the quote that has captured my imagination. It is an inspiring notion. The most impressive and gravity defying postures, the peace of mind and steadfastness of renunciates, and the spiritual ecstasies of transcendent bliss… all of it is coming if only you practice. There is no questioning the determination and persistence of people who religiously practice Jois’s ‘ashtanga vinyasa’ system of yoga. It is physically challenging and well known, as was Jois himself, for pushing the limits of what is conventionally considered a healthy range of motion. Committing oneself to a daily practice will cultivate persistence and strengthen your personal resolve. And that is not the only benefit. Cultivating and expanding ones’ range of motion seems like a healthy approach to living in one of these human bodies. Everybody knows your body starts to shrink and shrivel up in old age, so why not push out into the reaches of your range of motion if only that so you have a long way to fall as the body begins its final descent back to the earth. However this embodied expansion project involves far more factors than just hard work and dedication. There are a number of genetic and cultural influences that shape and guide our path of development. Sadly, Jois was either wrong or overly optimistic. Most of us will never do the splits. Most of us will never touch our foot to the back of our head in a jaw-dropping and awe-inspiring backbend. Most of us will never “float” from a seated position up to a handstand. If you can do one or all of these things, well…congratulations. That is very cool. But most likely it came with equal parts natural ability and practice. A posture like lolasana (pendant pose) for example requiresthe right proportion of torso length to arm length in order to get your legs to lift up off the ground. It is true that with practice even people with little t-rex arms can get a some lift, but not nearly to the extent that somebody with the right proportions can get. Practice will not lengthen the bones of your arms. Practice will not make a very broad rib cage into a narrow one. It will not make soft, gooey hamstrings out of scarred and rigid ones. Practice will not alter the shape of your pelvis, and there is a good chance the bones of your pelvis are preventing you from draping your torso over your legs in luxurious seated forward bends. Practice is not magic. It cannot re-shape bones after 20 years of sitting in a desk. Practicing yoga postures can expand your range of motion and bring so many improvements in terms of how we move and feel on a daily basis. But there are limits. I will not practice for a promised a tomorrow that may or may not come. I practice yoga for presence…for being present and not for the future. Chasing after yogic accomplishments is a dead end. It is the American Dream version of yoga. At the end of your life, you will not care about what postures you managed to squeeze out of your embodied experience. So let it all come. Or not come. Let some of it come. Whatever it is. That is not why we are here. This is our dance. We are writing poetry with our bodies. The song of our breath expands and contracts with our lungs. It is not an offering to the gods of progress and accomplishment, it is the hymn of the here and now. I write poetry sometimes. I did so with much greater frequency when I was in my late teens and early twenties, but still I write when I get a chance. Poetry is, like travel and intentional bad decisions, something that requires some empty space in ones’ life and mind. Lifemind: the psychophysical storyboard of the world, upon which gross and subtle objects dance across the reflective surface of awareness. In Samkhya philosophy it is called prakriti, the ever-changing domain of nature. It is not limited to physical matter, but includes more subtle elements like thoughts and memories as well. Space in the lifemind is a beautiful thing. If you have a spacious lifemind you should put your hands in the air and scream like you are at a Bruce Springsteen concert. When you have space you can breathe out. You can stretch out and take risks. You can play, dance, and touch the perceived edges of your being. It is not only for the young, but also for the lucky, and also for those who know the alchemical magic of its creation. A telekinetic field effect joins us. She moves me with her mind. Her eyes animate my emotions. Like thunder shaking the foundations of my home, my attention is compelled and my lifeworld is filled. She fills me with bliss. She decapitates me and wears my severed head as a charm on her necklace. I retreat to silence, but she calls to me. I choose her. She is who you think she is, but more than that. First I would suggest that you at least buy me dinner before trying to get into the yoga philosophy sack with you. Then I would probably that is means “yoga is making thoughts stop moving,” because that is the standard translation. I believe Iyengars’ translation was “stilling the fluctuations of the mind.” Either of those would be fine. But as I prepare for a lecture on the sutras, these translations, and the thought process that illuminates them, are on display. And I am not sure I like what I see. There are so many questions. What exactly is this “mind” thing? For how long does it have to stop thinking? Can it start thinking again afterwards, or is it like that heart that beats continually until it stops forever? Are all thoughts fluctuations? Are there some thoughts that, as long as they are not moving, will not prevent us from experiencing yoga? I cannot simply translate that sutra and move on. If the “mind” is that part of us that retains our sense of identity, I think my family would prefer I stop practicing yoga immediately in the event that my ego dissolves and I become as pure and clear as empty space – instead of a son, a husband, and a dad. According to this definition of yoga I would want some kind of guarantee that I would get my ego back when I’m done. Like a coat check for our sense of self. I just hope nobody was digging through my coat pockets while I was dancing. The effects were good but did not last. To scale the mystic heights of bliss. Before my vrttis do nirode.